Irish linebacker Prince Shembo regarding the Lizzy Seeberg case. In promoting the upcoming Inside Look episode, Comcast SportsNet's website raved about how "Pat Boyle's exclusive one-on-one interview with Notre Dame Football Head Coach Brian Kelly...delivers a candid discussion as he opens up about the tragic 2010 suicide of St. Mary's College student Lizzy Seeberg that was linked to an alleged sexual battery assault involving former ND linebacker Prince Shembo." 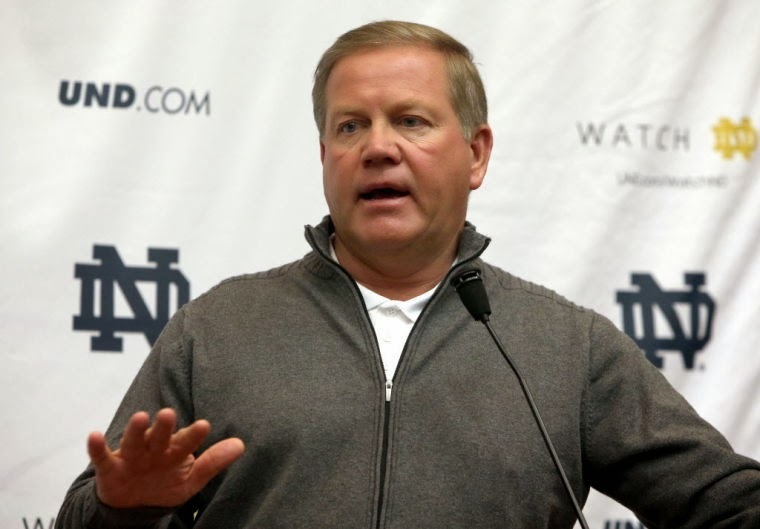 But although the show gave you a good feel for Kelly's secular coaching philosophy (he doesn't mention God or Our Lady even once) and his (and the administration's) handling of the Declan Sullivan, Manti Te'o, and Everett Golson situations, Lizzy Seeberg's tragedy was left for the most part in limbo, and was more revealing about what it didn't say about the case than what it did. Certainly Prince Shembo finally opening up to his involvement in the Seeberg scandal (if only because his "name was going to flames" among the NFL scouts) forced Kelly's hand. 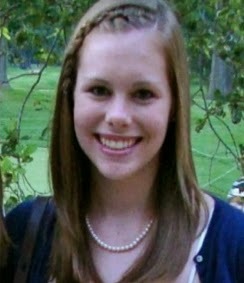 Still, for a situation in which Lizzy was (allegedly) sexually assaulted by Shembo, then committed suicide after receiving a threatening text about the consequences of messing with Notre Dame football, and getting little help from the campus police, Kelly played his cards about as close to the vest as he could. For example, Kelly's "admitting" that he and the ND powers to be aren't saying 'we did everything right,' he also isn't admitting to doing a single thing wrong either. Of course, Kelly (and the administration) didn't exactly admit to doing anything wrong in the Declan Sullivan (in which a student manager fell to his death when gale winds broke the lift he was filming the Irish practices from) or the Manti Te'o "catfish" case (when Te'o found out his online girlfriend who died of cancer was a fake). But these tragedies at least ended well...or as well as could be expected, while Lizzy's response seems to be getting worse. As Tom Seeberg noted, the university and police more aggressively investigated the 2012 case of linebacker Manti Te'o's fictitious girlfriend than that of his dead daughter. "In a he-said-she-said matter, you can quickly gather forensic evidence to try to determine what happened there, or you can let it linger like they did. Let evidence spoil," Seeberg said. Meanwhile, in the Comcast interview, Kelly spoke about how amazed he was at how well Declan's parents have accepted the situation, how close he has grown to them over the years, and how the plaque (which includes a poem the family chose) to Declan near where he died, ensures that he and the team will continue to honor him. Contrast this to the fact that not only does Lizzy not have a plaque (or statue, as I suggested) at Notre Dame, but Kelly, let alone University president, Fr. John Jenkins, have yet to even say they are sorry to the Seebergs, instead implying off the record to rich alumni that Lizzy's depression and mental state were to blame. "Coach, Shembo said that the sexual contact between the two was mutual. But do you agree with Prince that there is nothing wrong with touching a girl's breast–on the first date? If not, wasn't this aggression worth at least a one-game suspension?" "You agreed with Notre Dame's harsh suspension of your starting quarterback Everett Golson for an entire season for academic improprieties. Does it not seem hypocritical to you that this same strict administration conducted almost no investigation into the even-more serious charge of sexual assault?" 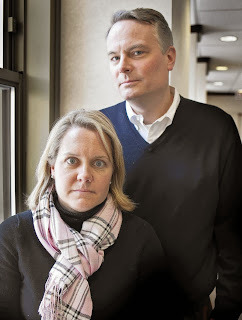 "You said you can empathize with Declan Sullivan's parents. Wouldn't this same empathy compel you to reach out to Lizzy's folks as well?" Indeed Kelly, who told Boyle that coaching means "opportunities for me to lead...to make each situation better," still has countless ways to make this one better for Tom and Mary Seeberg. He could donate money to Lizzy's charity, or he could hold a joint fundraiser to raise funds for both Lizzy and his wife Paqui's breast cancer cause. He could ask Tom to speak to the Fighting Irish on the importance of being a "Notre Dame Man," especially regarding dating situations. Or Kelly could simply tell them he is paying for a Mass for Lizzy at Notre Dame Basilica, and is praying for her soul. None of this will bring Lizzy back (at least not in person). But it might bring Tom and Mary (whose families have sent a combined thirteen students to St. Mary's or Notre Dame) back to campus, a place that has never been the same without them.